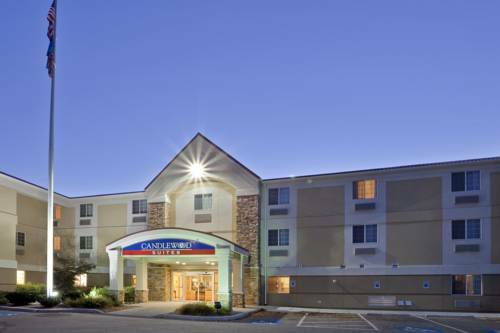 Hotel's Location in Meridian, ID is a Treasure Valley GemIf you're seeking lodging for a weekend getaway, spacious accommodations for an extended business trip or hotels near the Boise airport that put the metro area at your fingertips, opt for the Candlewood Suites Hotel Boise - Meridian. This award-winning, all-suite property places patrons just off I-84, ensuring convenient access throughout greater Boise.Corporate travelers appreciate this hotel's location. While in Meridian, Idaho visitors can count on a hassle-free commute to Citi Financial, T-Mobile, Micron and Hewlett-Packard, among other corporate destinations. A 670-sq-ft event facility provides a venue for meetings, as well, and guests find it easy to keep up with office demands thanks to fax services and the free Wi-Fi access.. In addition, patrons are within a short drive of such metro area attractions as Zoo Boise and the Discovery Center of Idaho. Local highlights like the Meridian Symphony Orchestra and Roaring Springs Water Park are also within minutes of the hotel's property in Meridian.Here, Idaho visitors enjoy all the flexibility of home. Convenient 24-hour amenities include a Fitness Center, free laundry facilities and the Candlewood Cupboard. A free movie library and guest grills are also available. We invite you to "Consider Us Home." Goodwood Barbecue: Top notch barbecue restaurant with unique menu items, prime rib, ribs, and steak. Also have great salad, soup, and sandwiches. Slow cooked over unique hardwoods. Harry's Hideaway Bar & Grill: Come for some of the coldest beer in town and stay for the burgers, appetizers, salads and all things Harry, from Dirty to the one who met Sally. Meeting Room 1: 670 Sq. ft. Meeting Room able to accomodate numerous setups including: Theatre, U-Shape, Classroom, and custom setups. Coffe & Water Service is included with the room package. Projector with A/V Cart and projector screen availble upon request. Old Navy Clothing StoreClothing Store, Women's Apparel-Retail, Men's Clothing & Furnishing. Old Navy provides the latest fashions at great prices for the whole family. Including Maternity, Womens, Womens Plus Sizes, children, infants, teens, and men. Hobby LobbyThe ultimate art and craft store! Home decore, scrapbooking, art work, painting, knitting, sewing, crafting, beading, and more! Sportsmans WarehouseHunting, Fishing, Outdoors, camping, boating, knives, tools, and more! The Idaho CenterThe Idaho Center, at the Crossroads of the Northwest, is one of the most versatile and accessible facilities of its kind in the West. Indoor arena concerts, sports, shows, expos, etc. P.O.S.T AcademyIdaho Peace Officer Standards and Training is located just near the Candlewood Suites on Stratford Drive. Gowen FieldGowen Field is part of the Idaho Army National Guard. Their mission includes, To underpin readiness of the force by serving as a training center and a support site for power projection missions. T MobileBring your business up to speed with 4G innovations, a powerful network, and flexible plans.